So happy to be hopping with Laura over at Laura's Loft today. With Easter and St. Patty's Day coming up we wanted to show you some creations with those holidays in mind. If you arrived here from Laura's blog I know you enjoyed what she created for you. If not you can click on the previous button below and it will take you there so you can check her out! We have an absolutely awesome guest designer this month! Laura is having a GIVEAWAY and the winner gets this awesome prize!! 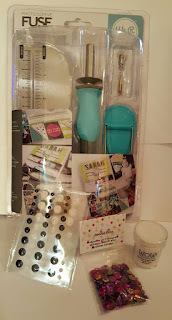 The details of Laura's GIVEAWAY are at the bottom of my blog. Let's not forget Christmas Stamps & Dies are 45% OFF and if you spend $75 get $10 off with coupon code $10off75 on Laura's Loft! From the moment I saw the Lovely Links Fri-Dies I wanted to make a St. Patrick's Day card with it. I know it is intended as a hearts and love theme but I saw four leaf clovers. To start this card out I chose several shades of green card stock and cut them with the dies. Then I arranged the dies on a 3 3/4 x 5 1/4 piece of white card stock and ran it through my Big Kick. I took another piece cut the same size and put a piece of Stick It on it then attached the piece of die cut white card stock lining it up so it was even. I inlaid the white link pieces and then started putting the Hearts and circles in, in various shaded of green. After I finished I ran the finished piece through my Big Kick to make sure the were in good. I used a Sentiment from CAS-UAL Fridays Clover, stamped it in Versa Mark on Vellum and heat embossed it in WOW Rich Gold. I couldn't really decide where I want it and after moving it around several times I cut it apart and adhered it between the links. 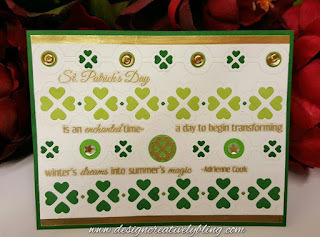 I also used the same embossing powder to add the Clover on the middle circle. I added some sequins from Design Creative Bling Puttin On The Ritz mix. The last couple of things I did was Mont it on a piece of MFT Gold Shine card stock and then a piece of MFT Dill Pickle card stock. plastic that Gwaltney bacon sits on in it's package. I sprayed it with adhesive and lined it up in the center of my white card base. 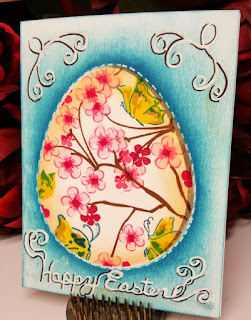 I used Altenew's Vintage Flowers and Painted Butterflies and stamped my images using Altenew inks. after I finished this part I removed my stencil and covered my egg with the negative and began with the lightest color Altenew Blue and worked my way up to the darkest with a blending dobber blending the colors all around the edge of the egg getting lighter as i went outward. When this was done I re positioned my original stencil and used Buttercream around the edges. I placed the negative back down with the stencil and slightly offset it to blend in a shadow. 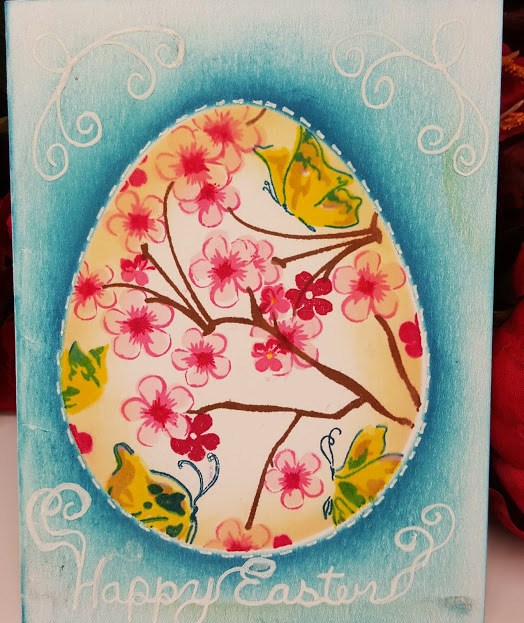 I wrapped up this card by drawing my flourishes, sentiment and dash lines around the egg in white Signo Gel Pen then shadowed them with a black marker. 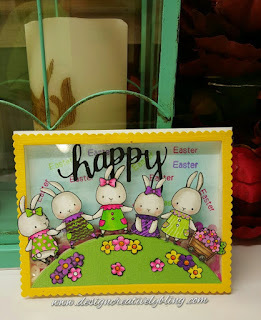 I first colored the Bunnies and flowers then cut them out on my ScanNCut 2. I used Mementoe's Duel Marker Pen to finish of the edges and make them standout. I used the Balloon edge from MFT Blueprints 26 to cut my hill. I trimmed the balloon tail off. I used MFT Blueprint 20 Scallop and Stitched Frame to cut the yellow frame. 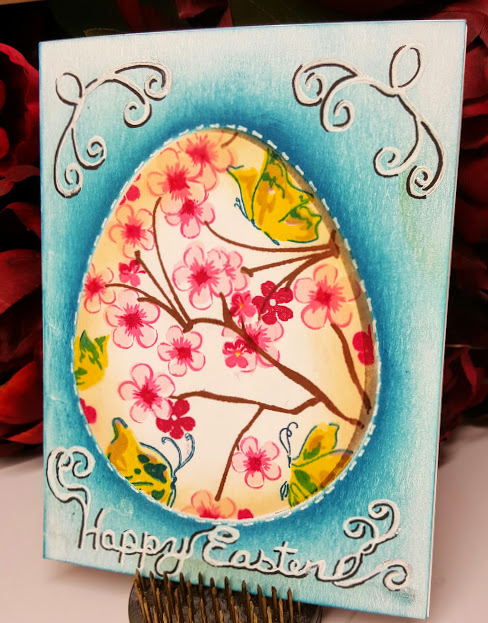 For the background I blended TH Tumbled Glass to make a sky then stamped the sentiment from Newtons Nook Simply Seasonal in different distress inks. 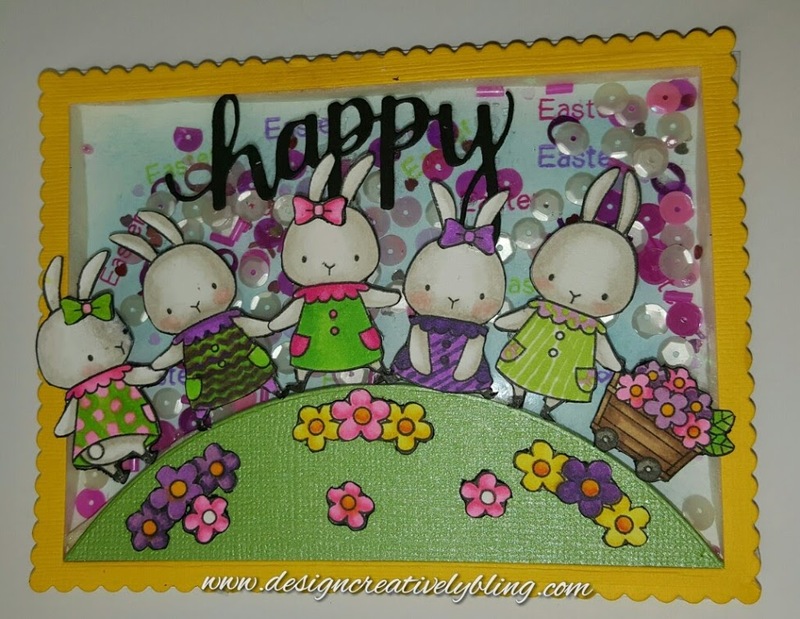 I used the die from Hero Arts Happy Stamp and Cut to cut the word happy. To assemble this card I first put my frame on a piece of acetate. Then began gluing down the rest of my scene. When I was done I flipped it over and added my foam tape. I used Design Creative Bling Raspberry Crush Sequin mix. The last thing I did to finish it up was put the back on and pressed firmly around the edges. I used MFT Blueprint 3 & 20 plus MFT's Peek a Boo Window to cut my pieces. When I layed them out I decided the solid light green needed breaking up so I laid a stencil over it and sponged some green ink over it. I took a piece of Neenah Solar White card stock and stamped the shamrock from Newtons Nook Simply Seasonal in various green inks. I used Hero Arts Happy Stamp And Cut Happy Die and cut a piece of black card stock. 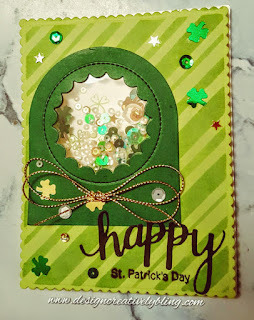 St. Patrick's Day is stamped in Versa Fine ( not sure why but where it was stamped over the ink from stenciling it bleed some and the part not over the ink is fine). I adhered a piece of acetate on the backside of the window then made my shaker out of foam tape. I added some Design Creative Bling Just My Luck sequin mix to the shaker then put the back with the clover stamped on it down and pressed all over to seal it. I finished it up my adding sequins and gold cord. I hope you enjoy these as much as I did creating them. Next on our line up is Jasmine. 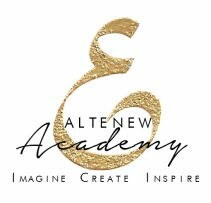 You won't want to miss what she has created so click the next button and it will take you there. 2. Deana Benson- You are Here! There are several ways to enter and the more comments you make in the different social media outlets, the more entries you earn! It is required that you comment on each blog in the Hop. After that, you are encouraged to like, and comment on our Facebook page, tag on our Instagram post and pin on Pinterest, as well as share on your own pages. The participant with the most entries wins the fabulous prize package! How cool is that!?! Always love all your cards!! you are so talented, absolutely gorgeous work! I really like your sharker cards. that Easter egg cards ia fabulous. Great cards! That bunny one is just to stinkin' cute. 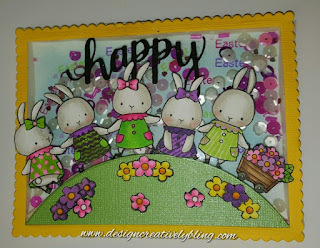 I just love the bunnies!-Heather C.
I love all your pretty cards! There is so much color and fun!Thanks for the inspiration! Love your cards, especially the shaker card! You've really been working overtime on these lovelies! Way to go! Thank you! Once I get started it's hard to stop. lol All these ideas pop in my head.